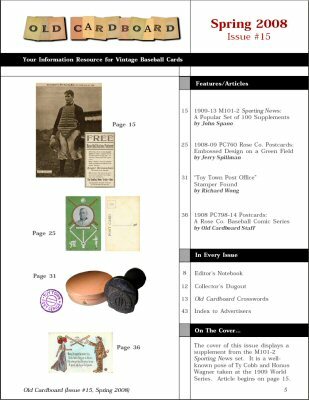 The cover and the table of contents for Issue #15 are shown below. 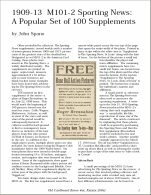 1) "1909-13 M101-2 Sporting News: A Popular Set of 100 Supplements" by John Spano. 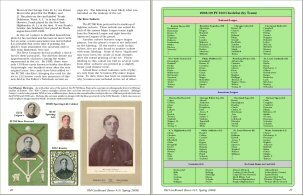 An overview of these popular and long-running newspaper inserts includes a full gallery of all 100 supplments. 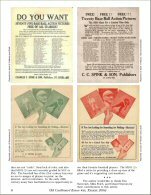 Details about the various promotions printed on the backs of some of the supplements are also provided along with never-before-published images of all four known back promotions. 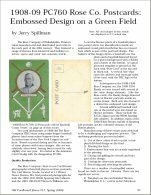 2) "1908-09 PC760 Rose Co. Postcards: Embossed Design on a Green Field" by Jerry Spillman. 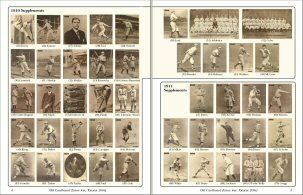 An important update to one of the most attractive and historic of all baseball postcard sets. 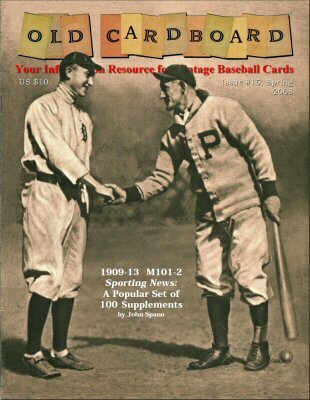 Includes a checklist organized by team and a discussion providing a convincing argument for how many different cards were originally produced in the scarce set. Checklist includes five previously uncataloged postcards. 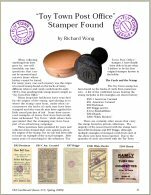 3) "'Toy Town Post Office' Stamper Found" by Richard Wong. 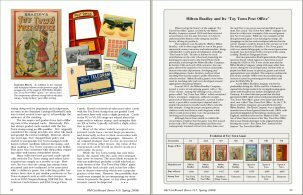 After many years of speculation about the origins deadball-era baseball cards with "Toy Town" stamps on the backs, author Wong reveals for the first time the actual stamper used for stamping the cards. 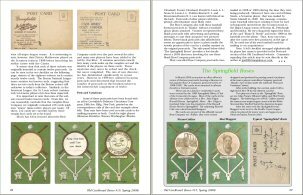 Examples of stamped cards from five different vintage sets are shown, along with details about the Milton-Bradley game in which the stamper was found. 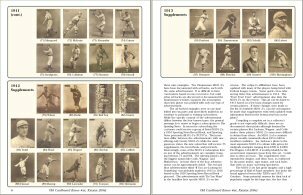 4) "1908 PC798-14 Postcards: A Rose Baseball Comic Series" by Old Cardboard Staff. 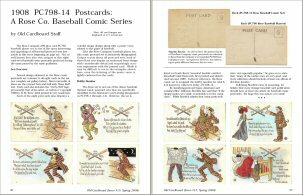 Rounding out the "Rose Company" focus in this issue, this two-page article presents a set of eight baseball "comic" postcards also produced by the Rose Company during the same timeframe as the more popular PC760 issue. 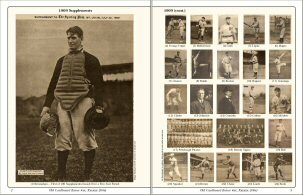 Images of all eight cards in the set (which now carries the hobby designation PC798-14) are provided.